A hearing dog is specially trained to alert a person to sounds important in the home and daily life. The dogs are trained in obedience, social etiquette and are taught to alert their partner to vital everyday sounds, such as: smoke alarm, oven timer, alarm clock, doorbell, door knock and telephone ring. 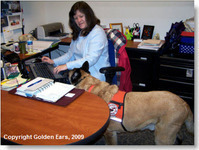 The dogs work alongside deaf/hard of hearing individuals. Their human partners learn to work as a team with their dog in the challenges and joys of this unique relationship. 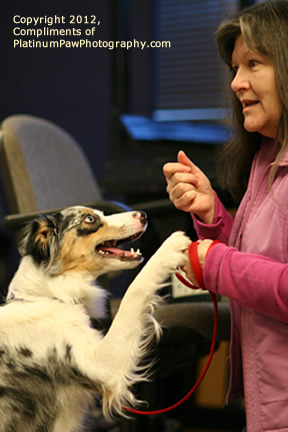 Golden Ears currently has an owner-training program for qualified individuals and their dog. We test the approved applicant's dog for appropriate sound response and the dog must have their health checks done prior to the dog's acceptance into the program. If an applicant does not yet have a dog, Golden Ears may be able to refer them to dog rescue organizations and local animal shelters to help them rescue a dog that has good temperament and are alert and responsive to sounds. Contact us for more information. Who qualifies for the Training Program? In order to be eligible for the Golden Ears Hearing Dog Training Program, individual applications are reviewed for hearing loss as noted in the submission of a current audiogram. Generally priority is given to those with severe to profound hearing loss. Please Note: We currently train in Washington State only. This is a 2 year training program, so please be sure you are ready to commit to that length of time. See our Frequenly Asked Questions for more information. We are a non-profit charitable organization. Golden Ears Hearing Dog Training Center is granted nonprofit status under 501 (c) (3) from the Internal Revenue Service (Tax ID Number: 91-1593277). 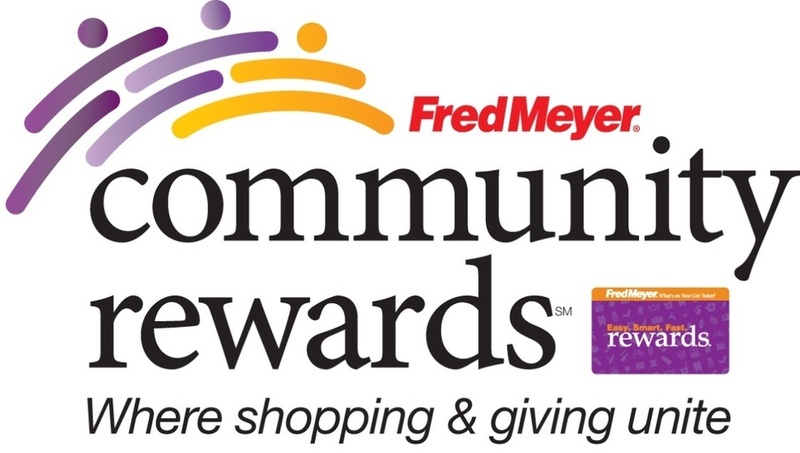 Golden Ears is also registered with the State of Washington as a nonprofit center and Charitable Organization (Number: 8559). Golden Ears was founded in 1993. The organization is named in memory of Golden Ears' founder, Linda, first hearing dog Nicky. Breeze demonstrates how she alerts Linda to a sound.